* In French, it is "Stade Olympique"
** In 2003 and 2004, many Expos "home" games were played in Hiram Bithorn Stadium, in Puerto Rico. * The Expos began playing there in 1977. & Nominal capacity was reduced from 60,476 to 46,500 in 1993, and foul territory was reduced from 36,300 to 27,500 square feet in 1992. 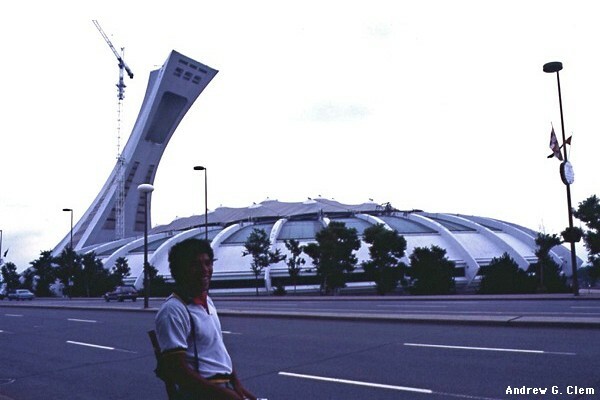 BEEN THERE: I saw Olympic Stadium while traveling through Canada in 1987. This sad colossus bears many tragic similarities to Cleveland (Municipal) Stadium. It was originally built for the Olympic Games (1976), and was intended to be used for baseball and football thereafter. It was enormously expensive, however: The original estimated cost of the stadium itself was C$120 million (Canadian dollars), but but that escalated quickly because of engineering difficulties. Labor stoppages caused further delays, so the facility remained in an incomplete state when the Olympics began. Like "the Mistake on the Lake," Olympic Stadium came to be regarded not just as a white elephant, but as a dark and depressing place to play baseball, with many thousands of empty seats game after game. It was quite a contrast to Jarry Park, the Expos' original ("temporary") home. One of the features revealing its unsuitability for baseball was the fact that the "dugouts" were at ground level (like Riverfront Stadium and the Metrodome. As is/was the case in Exhibition Stadium, the extreme oblong shape of this stadium was due to the much longer length of the gridiron in the Canadian Football League: 480 feet (160 yards) altogether, rather than 360 feet (120 yards). It had a very large lower deck and an upper deck that stretched far beyond the center field fence, much like Baltimore's Memorial Stadium, except that the lower-deck overhang was much smaller: 25% vs. 60%. The original capacity for baseball games was almost 60,000, the fifth biggest in the majors for most of its lifetime. Major renovations began in 1991, as the lower deck in center field was removed in preparation for the installation of a new, much bigger scoreboard. (That section had had a steeper pitch than the rest of the lower deck.) Coincidentally, in September of that year a large chunk of concrete fell from the roof, forcing the Expos to play their last 13 home games on the road. When the 1992 season began, the outfield sections of the (shrunken) upper deck were closed, reducing the official capacity to less than 44,000. (It was raised to 46,500 in 1993.) In addition, a big chunk was carved out of the grandstand in back of home plate and along the foul lines in each corner, so that the diamond and the outfield fences could be moved back by about forty feet. This was done to bring fans closer to the action, but fans right in back of home plate sat 15 feet above the field, like at the Metrodome. Nice try, but it still didn't feel like real baseball. Meanwhile, most of the lower deck beyond the foul poles was severed from the rest of the grandstand and swiveled to a position just in back of the outfield fence. These retractable "bleachers" filled in the huge amount of open space beyond center field. Finally, the bullpens were moved into the very wide and exceptionally long "alleys" between the stands and the foul lines in each corner. For most of this stadium's history, the bullpens had been located beyond the fence in in right-center and left-center fields. Canadian football has had a troubled and confusing history at Olympic Stadium. The Montreal Alouettes played there from 1976 until 1981, after which the franchise folded. In 1982 they were replaced by the Montreal Concordes, which were renamed the Alouettes in 1986, but went out of business just before the 1987 season began. Montreal was without football until 1996, when the CFL Baltimore (!) Stallions were relocated there and become the third Alouettes franchise. In 1997 the Alouettes were displaced by a U2 concert to McGill Molson Stadium, where they have played nearly all their home games ever since. It's hard to remember now, but baseball used to be very popular in Montreal. Led by Gary Carter, Tim Raines, and Andre Dawson, the Expos won the NL East divisional title in 1981, but were edged by the Dodgers in the fifth and deciding game of the the NL Championship Series. The Expos were leading the N.L. East once again in August 1994, and then The Strike killed baseball spirit for good in Montreal. For the rest of the 1990s, attendance dwindled to an average of under 10,000 fans per game. For a few years there was talk about building a new, smaller stadium in downtown Montreal, but the city was in no mood to subsidize a private sports franchise. It's understandable, given how badly they got burned on Olympic Stadium. The franchise suffered mounting financial losses, and its owner Jeffrey Loria was finally allowed to "trade in" the Expos as part of a three-way transaction in which he acquired the Florida (now Miami) Marlins after that team's owner John Henry purchased the Boston Red Sox in early 2002. From that point on, the Expos were owned by Major League Baseball itself, in effect a "ward" of the other 29 franchises. As a gimmick to boost team revenues, MLB officials worked out a deal with the city of San Juan, Puerto Rico, under which the Expos played 22 games in Hiram Bithorn Stadium in both 2003 and 2004. Fan enthusiasm faded soon, however, ending any chances for relocating the Expos to the Caribbean island. With no viable alternatives, Commissioner Bud Selig finally approved the relocation of the Expos to Washington D.C. just before the final Montreal home game of the 2004 season, played on September 29. The Expos lost to the Marlins 9 to 1, cheered to the end by 31,395 teary-eyed fans. Adieu!